SOUTH ELGIN, Ill. (WLS) -- A suburban seventh grader beaten by a classmate at school got a big show of support from a Chicago Cub. Henry Sembdner suffered serious injuries after he was attacked at Kenyon Woods Middle School in South Elgin back in February. He's a huge fan of the Cubs and likes to play ball himself. 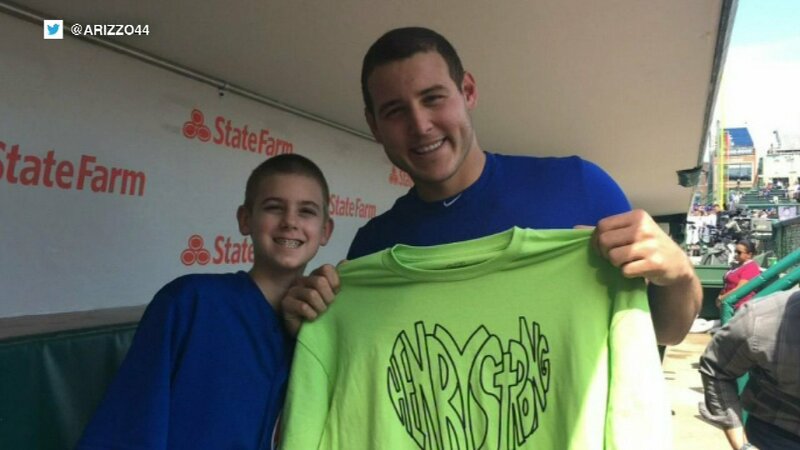 Saturday afternoon, he went to the game at Wrigley Field and spent some time with first baseman Anthony Rizzo. Rizzo then tweeted, "Glad I finally got to meet you Henry. Remember to keep staying strong! You will be back on that baseball field soon. #HenryStrong." A fellow student has been charged in the attack. The 14-year-old suspect faces three charges - one felony count of aggravated battery and two misdemeanor counts of battery.